One of the most historic of all North America's cities and known for its youthful college residents from nearby Harvard University, Boston is a real New England highlight. The Boston Globe is a popular local newspaper that may well be invaluable for visitors, while others simply come to this city to catch the Red Sox playing at the iconic Fenway Park baseball park. A stroll along the Freedom Trail is a good place to start a day of sightseeing, being easily accessible from most parts of the city center. Overlooking the Common, Beacon Hill is a particularly interesting neighborhood, with its contrasting architecture - both colonial and modern. 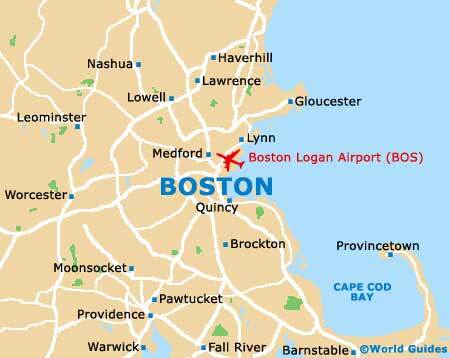 The following Boston travel links are provided below to help you plan your itinerary. Greater Boston Convention and Visitors Bureau - 2 Copley Place. Massachusetts Office of Travel and Tourism - 10 Park Plaza. Cambridge Office for Tourism - 4 Brattle Street, Cambridge. Duck Tours - tour depart from the Museumof Science, Prudential Center or the New England Aquarium. Old Town Trolley Tours - boarding and alighting at 20 stops around the city. New England Aquarium - 1 Central Wharf. USS Constitution - Charlestown Navy Yard, Charlestown. National Historic Park - Charlestown Navy Yard, Charlestown. Boston Public Library - 700 Boylston Street. Cheers Beacon Hill - 84 Beacon Street. Franklin Park Zoo - 1 Franklin Park Road. Symphony Hall - 301 Massachusetts Avenue. Ghosts and Gravestones Tour - departs from the Marriott Long Wharf Hotel, 200 Atlantic Avenue. Boston Harbor Cruises - Whale Watching - departing from Long Wharf. MIT Museum - 265 Massachusetts Avenue. HI (Hostelling International) Boston - 12 Hemenway Street. YMCA of Greater Boston - 316 Huntington Avenue (close to the Museum of Fine Arts). 40 Berkeley - 40 Berkeley Street. Charlesmark Hotel and Lounge at Copley Square, Back Bay - 655 Boylston Street. The John Jeffries House - 14 David G. Mugar Way. Hotel Buckminster - 645 Beacon Street. The Copley Inn - 19 Garrison Street. 463 Beacon Street Guest House - 463 Beacon Street. Chandler Inn Hotel - 26 Chandler Street. Nine Zero Hotel - 90 Tremont Street. The Gryphon House Bed and Breakfast - 9 Bay State Road. Copley Square Hotel - 47 Huntington Avenue. Boston Harbor Hotel at Rowes Wharf - 70 Rowes Wharf. The Liberty - 215 Charles Street. InterContinental Boston - 510 Atlantic Avenue. Wyndham Boston Beacon Hill - 5 Blossom Street. Beacon Hill Hotel and Bistro - 25 Charles Street. The Boxer - 107 Merrimac Street. Logan International Airport (BOS) - 1 Fish Pier, Harborside Drive / Massachusetts Turnpike, near Winthrop / Chelsea. Worcester Regional Airport (ORH) - 375 Airport Drive, Worcester, near West Tatnuck. Massachusetts Bay Transportation Authority - MBTA - bus, ferry and train services. Advanced Coach Car Service - luxury limousine services in Boston. Priority One Auto Rental - luxury auto rental / in-terminal provider at Logan Airport. Jack Madden Ford Rentals - car, van and truck hire, based in the neighboring town of Norwood.